Winter is around the corner and if you’re planning on laying up your motorhome or caravan for winter then you’re going to need to drain down your water systems. It’s a condition of our caravan and motorhome insurance policies to drain down your leisure vehicle between November 1st and March 15th when it’s not in use to prevent any frost damage to your water tanks or pipes. Here we take a look at the new integrated Floë system, which will drain down your caravan or motorhome in just two minutes by using compressed air to blow any excess water out of your pipes and taps. It’s also an effective way of getting rid of any stale water and build-up of algae to make way for fresh drinking water. The kit takes around 20 minutes to fit to your vehicle and in six easy steps your vehicle will be fully drained down. Step 4: Open each tap in your caravan or motorhome individually, including the shower, until all are drained. 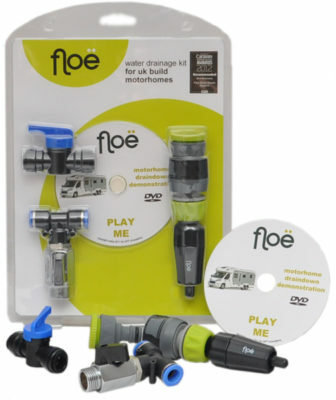 There are also portable Floë drain down kits for caravans and motorhomes, which also blow air through the system by connecting the kit to a foot pump or 12 volt air compressor with an accurate air pressure gauge. In this video, caravanner Dan Trudgian blew out nearly one litre of excess water from what he thought was his drained down caravan, using the Floë kit. 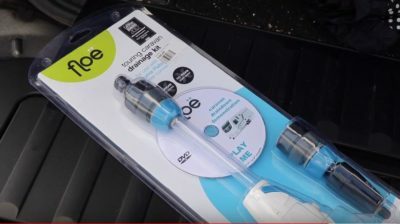 Jason Paul, of Apt innovations, invented the Floë system and said the kit enables owners to see how much water they’re taking out of their van’s water system and get more use out of their leisure vehicles in the winter months, with the extra peace of mind that their drinking water is clean. Floë is also approved by the Water Regulations Advisory Scheme and the National Caravan Council. 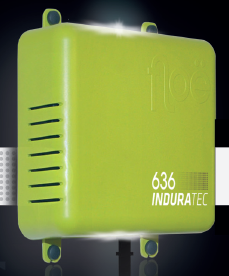 For more information about the Floë Induratec 636 integrated drain down system or their other products visit www.keepfloeing.com where you can watch their “how to” video. Floë has kindly offered a 10% discount code for our readers. Simply enter the unique code APT17101 at the online checkout when you order here. A good invention. Any product that reduces the risk of damage must be a plus. Very informative. Looks like a handy piece of equipment for us as we are pretty new to Motorhomes.